First of all, the people who say that are ultimately people who are weak or crippled themselves. They are people who don’t lift and are still messed up. To those people I simply say you have no right to lecture me on how I lift. Done. Second, I want to throw this out there: 80% of Americans will suffer back pain at some point in their life (WebMD.com) and it is the most common form of pain experienced by Americans. It is the leading cause of disability of Americans over 45 and more than 26 million Americans between 20 and 64 experience frequent back pain. (National Centers for Health Statistics) In case you can’t tell where I’m going with this, my point is that most people will experience significant low back pain in their life having nothing to do with lifting heavy. I’m going to go out on a limb and say that not that many of those 26 million people screwed up their backs doing a max deadlift. And even if lifting heavy messed up your back it looks like lots of sedentary people are feeling the same way. Given the choice between having back pain from being lazy and inactive or from pulling 3x bodyweight, I’d choose the latter. So what’s my point? I’m sick of the assumption that heavy lifting will cripple you. Heavy weights don’t hurt you; the way you lift heavy weights will hurt you. The best is when a trainer is the one saying that lifting heavy will cripple you. If you are a trainer and firmly believe that then you have immediately demonstrated to me that you lack the most basic understanding of resistance training and program design. Yet again, that means you have no business commenting on my lifting. In my opinion, most people have back pain because they are inactive and have any number of anatomical imbalances or weaknesses. We know that tip hips and weak or inactive glutes can yield back pain. I can’t tell you how many people (myself included) I have immediately seen improve their back pain by fixing one or both of those things. So before blaming the weight on the bar perhaps you should check yourself out to find out why your back hurts. Just a thought. Valuable exercise or debilitating movement? Ok so enough of the science and studies. Hopefully I’ve made my point that heavy lifting isn’t going to destroy your back and sentence you to a wheelchair. Like any sport, resistance training has potential risks. 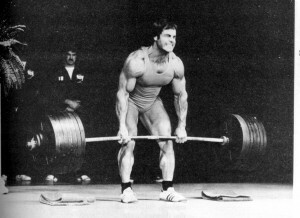 If you don’t use good technique and proper loading while lifting, you’re going to get hurt. If you decided to start weight training you are accepting those risks, just like if you play football you are accepting the risk of the many injuries associated with that sport. But when was the last time someone lectured you after you played a game of football that you are going to suffer permanent neurological damage and multiple concussions or mess up you knee? Don’t be afraid to lift. Just make sure you do it right. National Strength and Conditioning Association (2008). Essentials of Strength Training and Conditioning, 3rd ed., Champaign, IL: Human Kinetics. When someone makes a comment like that when I’m doing deadlifts I usually tell them that if my back hurts I’m doing it wrong.